Our dog Peanut endorses this natural soap with Neem oil, which has an abundance of great properties to repel parasites and insects while alleviating itchy and irritated skin. We blended Citronella, Peppermint, Lemongrass and Eucalyptus essential oils to make it even tougher for insects to bother your best friend. Due to this blend of essential oils, we have many people who work in the outdoors, who buy this soap as “human-soap”. Our dog shampoo soap is 100% natural. We use extra virgin organic olive oil (EVOOO) as the base oil, along with the extra virgin organic oils of coconut and sustainable palm. We then add Neem oil for added moisturizing to the dogs coat and rosemary oil extract (ROE) as a plant based natural preservative. 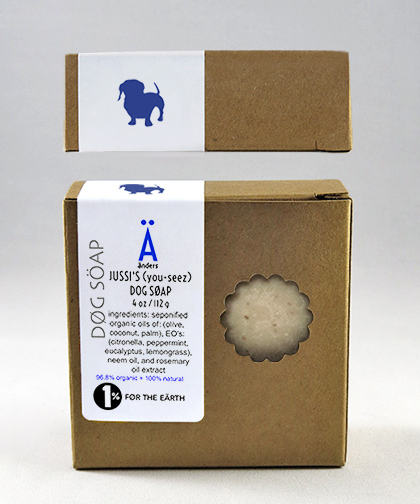 We make all of our dog soaps using the cold process method of manufacturing. This insures that the soap creates its own natural glycerin and the essential oils effectiveness is retained (by far the best soap making method). Citronella is a species of tall perennial grass that is native to warm temperature climates. Citronella essentials oils are obtained by the steam distillation of the freshly cut or partially dried grasses of Cymbopogon winterianus (Family: poaceae). This is known as the “Java” type of Citronella essential oil. Citronella essential oils are most commonly known for use as an insect repellent, but are also used in soaps, perfumes, aromatherapy, cosmetics and candle making. It has also been used as a cleaning agent. Citronella is said to be beneficial to calm a dog&apos;s barking. Cold pressed from the fruit and seeds of the Neem tree. Neem oil is very high in triterpenoid and triglycerides, making it extremely beneficial for use in bath and body products. A local Veterinarian recommended that we add this ingredient to all of our dog soaps due to its good qualities to aid dog&apos;s coats and skin.